Horse trekking holiday in Mongolia. Helping Dreamers Do. With vast steppes, arcing skies, pristine lake-dotted high meadows and snow-capped mountains allied to a grand equine tradition, Mongolia truly is the quintessential land of the horse trek. With daily rides varying from 15-45km, this tour on the backs of Mongolian steeds combines the majestic north of the country with the southern fringes of the Siberian Taiga, with plenty of chances to experience the warm friendliness and amazing rituals of various Mongol communities as you camp in glorious locations. Few foreigners have experienced the turquoise rivers and beautiful lakes of the wildflower-strewn great meadow of Darkhad Valley, where locals live with hairy yaks in the lee of grand peaks such as Soyo Mountain. 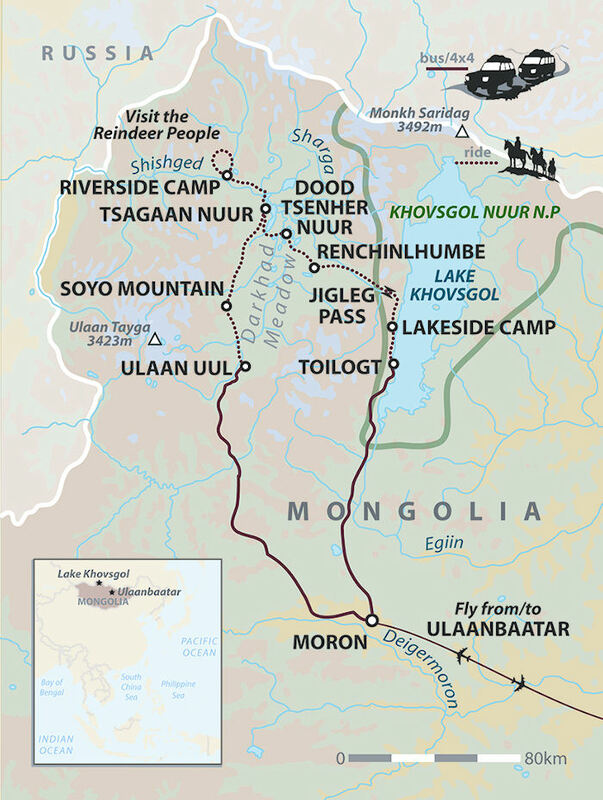 You'll also ride over a high pass through pine-clad mountains to Tsagaan Nuur, the most northerly village in Mongolia, in a breathtaking location on the shores of Lake Tsagaan Nuur. Water provides unforgettable memories throughout the journey – and not just the Meadow of Ten Lakes. Ford mountain streams on horseback, and cross the Shishged by small local ferry, watching out for river wolf Taimen - the world's biggest freshwater fish. Then ride through the taiga woods to camp on the shores of the majestic 136km long Lake Khovsgol. End the trip with a day exploring the surprising cosmopolitan sights of the capital Ulaanbaatar. In Central Asia we have developed unique relationships with many of the semi-nomadic peoples of the region and as tourism is becoming one of the main economical sectors of Mongolia, we are committed to making sure that the tourist economy benefits the local people. We work with Mongolian owned hotels and tourist Ger camps directly – these camps in the countryside hire local staff, creating thousands of employment opportunities and ensuring that money goes directly into the community. Although the tourist season is limited, this income allows country dwellers enough food and supplies to survive the harsh winters. To put this into perspective; Our drivers earns 250, 000 tugrik for one trip - these wages are equal to the cost of educating one child for a year or to feed his family for 1 month. In each part of the trip we employ local guides in addition to our Western guides, such as Bat-Erdene, Tulga and Munkhbat, which again places funds directly in the pockets of local families. We train our staff (both local and Western) to be responsible travelers in the countryside and to respect local community and environment. Also we have trainers for Leave No Trace Ethic. For our Mongolian staff we organize training of “Leave No Trace”, a program supported by the Mongolian Tour Guides Association. We also support several NGOs around the world such as the Hope Foundation, A-Cet and Adopt-A-Minefield, which are all carefully selected to improve the standard of living for the communities we visit. Everything! It was a marvelous adventure with a good mix of environments. The views across the plains were spectacular. So was riding along the rivers and lake-side. Visiting the reindeer people and shaman was very special. And the flowers, many many flowers. And nature (like the dancing cranes we saw). takes getting used to but it's how they ride over there! Be sure to have truly waterproof gear. We rode in one storm and I was grateful to have taken my riding coat, but wished I had taken some waterproof over-trousers too. The reindeer people's camp was the only place we stopped to purchase artifacts. In general these were of an "OK" level of quality for groups like ours. However I felt that there was an opportunity to in certain ways improve the quality of the items. There is a balance between authenticity and "sellability". I think that there is room for giving guidance on enhancing certain aspects of product quality (e.g. by "knowing your customer") while still retaining authenticity. In UB we visited the Winter Palace. The charge of 50,000 (over 25 dollars!) for taking photos was absurdly high and I didn't buy that option. I would recommend that the guardians should be advised to significantly reduce this charge (absolute maximum 20,000, but better 10,000) on the basis that lots of small amounts builds up to significantly more than NO high amounts!! I.e. they would get some income rather than none! More money would contribute to conservation efforts. An intense and highly enjoyable experience. Yes, it was tough at times, but no tougher than I had envisaged as an adventure-style holiday (I didn't select the tour to be taken around in luxurious comfort!). It was like nothing I had done or seen before, and I would not hesitate to recommend it to anyone with an adventurous spirit and no need for luxury! On the day that we rode to the reindeer people, we went up, and down, a mountain covered with the most delicate pine trees, and the forest floor was carpeted with flowers. The silence was absolute, the ground muddy and boggy, with tree roots and loose stones everywhere. The horses didn't put a foot wrong, and the wonderful pack horses amazingly wound their way between the trees without once bumping their enormous packs. It was like being in Fairyland. Take your own water bottle holders.